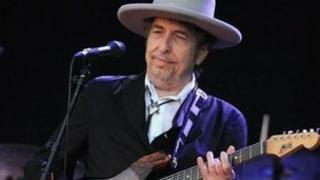 Bob Dylan has responded to suggestions he has plagiarised artists in his work and failed to credit his sources properly. "Wussies and pussies complain about that stuff," the veteran musician told Rolling Stone magazine. "In folk and jazz, quotation is a rich and enriching tradition. It's true for everybody but me. There are different rules for me." Dylan's 35th studio album, Tempest, was released this week. Earlier this year the 71-year-old received the Medal of Freedom, America's highest civilian honour, from President Obama. The singer was accused of borrowing from Henry Timrod, a 19th Century poet who died in 1867, on his 2006 album Modern Times. Another album, 2001's Love and Theft, was claimed to have passages similar to lines from Confessions of a Yakuza, the memoir of a Japanese gangster by author Junichi Saga. "As far as Henry Timrod is concerned, have you even heard of him? Who's been reading him lately? And who's pushed him to the forefront?" he told Rolling Stone. "If you think it's so easy to quote him and it can help your work, do it yourself and see how far you can get." "These are the same people that tried to pin the name Judas on me. Judas, the most hated name in human history!" he continued, referring to the controversy over his 1965 album Bringing It All Back Home. "If you think you've been called a bad name, try to work your way out from under that. And for what? For playing an electric guitar?" Dylan was born Robert Allen Zimmerman in 1941 and began his musical career in 1959, playing in coffee houses in Minnesota. He took his stage name from the poet Dylan Thomas. Much of his best-known work dates from the 1960s, when he became an informal historian of America's troubles with tracks like Blowin' In The Wind and The Times They Are A-Changin'. The musician's decision to move away from traditional guitar in favour of an electric version in the mid-1960s proved controversial among die-hard folk fans. "It's called songwriting," he told Rolling Stone. "It has to do with melody and rhythm, and then after that anything goes. You make everything yours." Bob Dylan: A living legend?